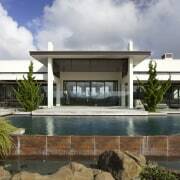 While it is important for outdoor areas to fit with the architecture of the house, they also need to connect to the scenery. 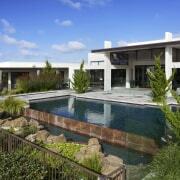 For this project by landscape designer Robin Shafer of Shafer Design and pool builder Carlos Morgan of Morgan Pools, it was essential for both the outdoor space and swimming pool to complement the surrounding landscape. 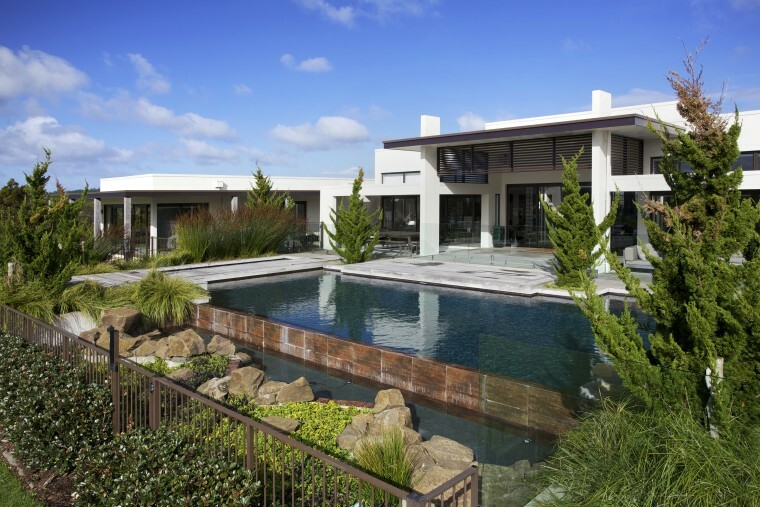 The owners wanted a contemporary, natural aesthetic that would maintain the connection to the wider views and the architecture while blurring the lines between the pool and garden, says Shafer. 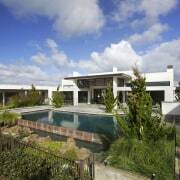 "The house had very distinct, clean lines and a strong indoor-outdoor flow. 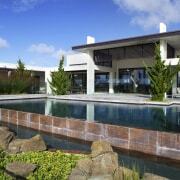 There was also a slightly Zen, Japanese influence so the outdoor area and pool were designed to pick up on this." 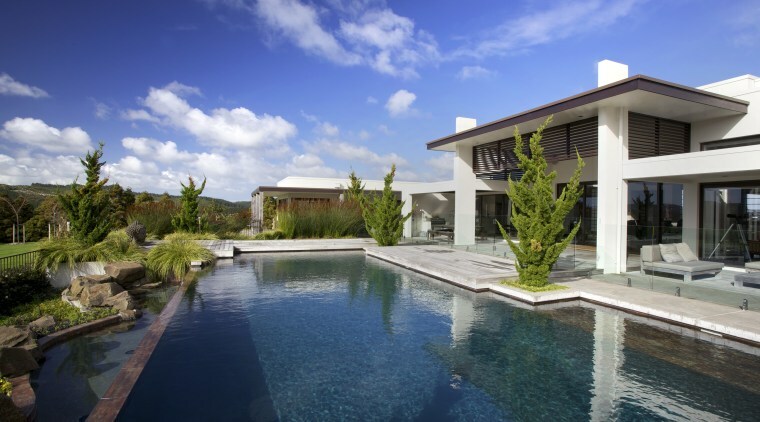 Designed by Robin Shafer, this Japanese-inspired landscape relates to the countryside and design of the house. 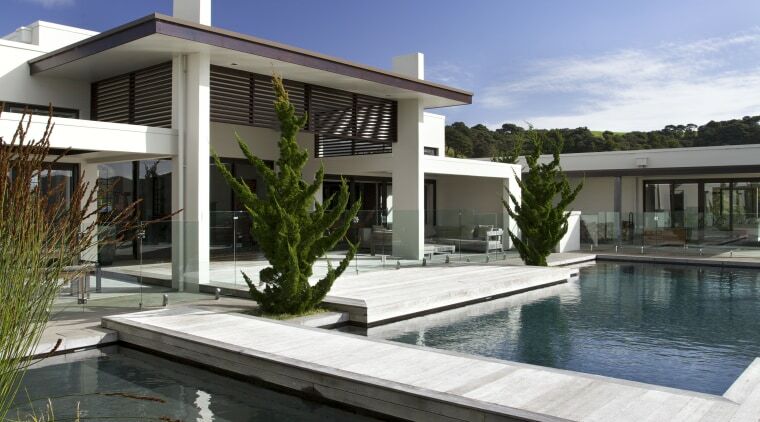 Several outdoor spaces were created to ensure privacy and wind control without compromising the views. 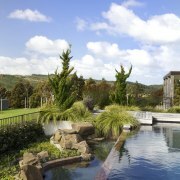 Kwila wood decking and a concrete pavement connect well with the natural outlook, while the Hydrazzo pool finish maximises reflections, giving a natural quality to the water. 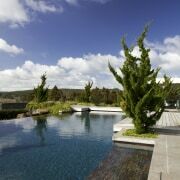 Lining the rim of the pool is a border of Italian porcelain tiles in earthy tones, selected to mimic the appearance of stone and clay on the edge of lakes. 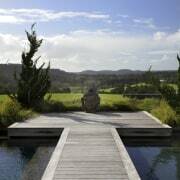 A boardwalk divides the pool into two, separating a shallow wading area from the deeper swimming pool. This design feature allows the owners' grandchildren to have shallow areas where they can play safely in the water, says Shafer. The kwila deck and boardwalk complement the natural colours used in the house and pool while the concrete paving adds solidity. The design is by Robin Shafer. "The boardwalk leads to a weir edge that drops down into a holding pond lined with rocks. Introducing a weir gave a number of additional benefits to start with, the lower level minimises the need for an intrusive pool fence. 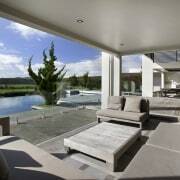 The view of the countryside then remains unobstructed, which enhances the natural aesthetic." 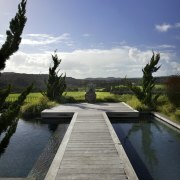 In addition, grasses planted at the rear of the pool alongside the rocks blend in with the countryside and pool area.